In 1911, Lieutenant-Colonel P. L. Murray, produced a marvellous Boer War reference detailing all the contingents sent from Australia to South Africa, giving a brief history of the formation and finally, listing all the soldiers who saw service in South Africa with that unit. The book was called, Official Records of the Australian Military Contingents to the War in South Africa. It is now the standard reference and starting place for any person interested in pursuing information about Australian involvement in the Boer War. This extract is from Murray, pp. 4 - 6. THE NEW SOUTH WALES LANCERS. A squadron of 100, under Captain C. Cox, had proceeded to England in 1899, to take part in the annual military tournament at Islington, and for training at Aldershot; the expense of which was defrayed entirely by the regiment. Upon the war breaking out, permission to volunteer was cabled for and acceded to. The detail, with their horses, then proceeded to Cape Town, where they were enthusiastically received, equipped with the service uniform and accoutrements, and despatched to the scene of hostilities. Captains - 20s. and 3s. 6d..
N.C, officers and men of the Permanent Farces would receive, from date of landing, Imperial rates of pay in addition to existing rates. "Separation allowance" was also granted to wives and families of N.C.O. 's and soldiers serving in South Africa, at varying rates according to rank. If in occupation of quarters or drawing lodging allowance, the wife received 4d. per diem; for each girl under 16 years 1½d. per diem; each boy under 14: years, 1½d. per diem. When not in occupation of quarters or receipt of lodging allowance, payment was made at rates varying from warrant officers' wives 2s. 3d. per diem, to privates' wives, 1s. 1d. Pay was issued by the Imperial Government after the landing of Contingents at Imperial rates. These varied from Lieutenant-Colonel, 28s. per diem and 4s, field allowance, to subaltern, 15s. and, 2s. 6d. ; and from 9s., R. sergeant-major. to 5s. privates. Buglers, saddlers, and farriers, 1s. per diem extra. 97 Privates, including cooks and batmen, 1 Saddler. Men volunteering were required to be from 20 to 40 years of age, preferably single, and good shots. Horses brought in had to be for M.I. work, and pass veterinary examination. Uniform consisted of brown F.S. jacket and pants, with puttees and hats. Fully horsed and provided with saddles. Also provided with regimental transport. The first draft arrived at Cape Town from England on 2nd November, 1899; it consisted of 2 officers and 69 sergeants and rank and file, with their horses. Of these, 2 were killed or died, 2 were transferred to S.A.C., leaving 2 officers and 65 others, who returned. The second draft left New South Wales an 28th October, 1899;.it consisted of 5 officers, 36 others, with 160 horses. Three were killed or died; 1 was transferred, 1 was commissioned in Imperial Army; 4 officers and 32 others returned. The third draft left New South Wales on 17th January, 1900; it consisted of 17 sergeants and rank and file, with 15 horses; 1 man was killed or died, 16 returned. The fourth draft departed 16th February, 1900; it comprised 1 officer and 40 others. Total: 8 officers, 162 others, with 246 horses. The squadron arrived home on 6th December, 1904, and 8th January, 1901. 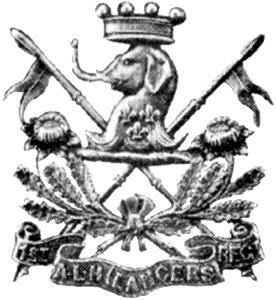 The detachment of this regiment undergoing a course of training at Aldershot at the outbreak of the war volunteered for active service in South Africa; the offer being accepted, they embarked on 10th October, 1899, and arrived at Cape Town 2nd November, 1899. Forth Draft - embarked at Sydney on transport Australian on 16th February, arriving at Cape Town 19th March, 1900. 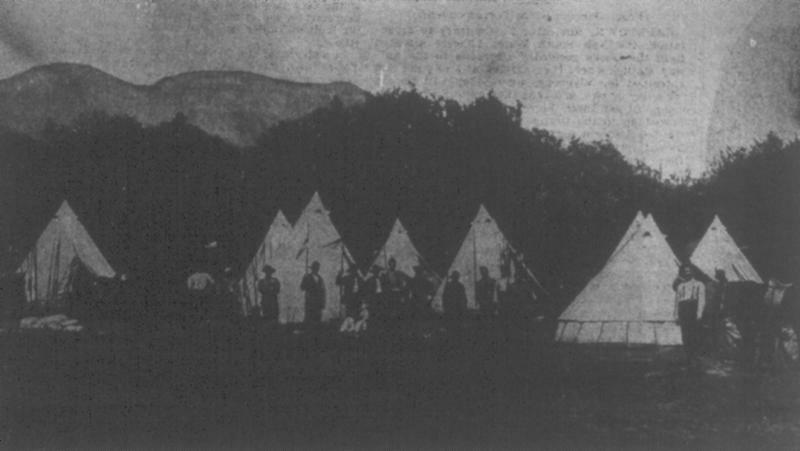 The Aldershot detachment after its arrival was attached to General French's command, and was employed on patrol duty in the Colesberg district. On the 6th December, the detachment, under Major Lee, with remounts for the whole squadron, arrived at Naauwpoort, Major Lee assuming the command of the squadron. Present at capture of Arundel on 8th December, and took part in several minor actions in the vicinity. A detachment of 28 men, under Lieutenant Osborne, temporarily attached to Lord Methuen's command, took part in the battles of Belmont, Grasspan, Modder River, and Magersfontein, and afterwards rejoined the squadron. On 2nd January, 1900, a supply train was, by some means started from Rensburg Siding, and ran on a down grade close to the Boer position; the squadron was ordered to recover or burn the trucks. As some of them were derailed, it was found impossible to recover them; they were, consequently, burned under a very heavy fire from the enemy. On the 16th January a troop of Lancers and Australian Horse, under Lieutenant Dowling of the latter regiment, when returning to camp at Slingersfontein, was surrounded; and after a sharp fight, in which Sergeant-Major Griffin of the Australian Horse was killed, Corporal Kilpatrick of the Lancers mortally wounded, and Lieutenant Dowling and Trooper Roberts severely wounded, the patrol surrendered. On the 7th February the squadron proceeded to Belmont, and on the 13th were attached to Scots Greys, forming part of the 1st Cavalry Brigade. Present at the relief of Kimberly on 15th February, action at Dronfield on 16th February, and at the operations which led to the surrender of General Cronje at Paardeburg. Took part in the battle of Poplar Grove on 7th March, and assisted to turn the: enemy's left flank. Present at Dreifontein on 10th, and at the occupation of Bloemfontein on 12th March. Captain Nicholson, with a detachment of 40 N.C. officers and men from New South Wales, joined on 5th May. The squadron was now attached to the Inniskillings, under Major Allamby and took part in the advance on Pretoria. Kroonstadt was occupied on 12th May; the Vaal River crossed on 24th May. Took part in heavy fighting at Klip River on 28th May, when Major Lee was complimented, by General French on the excellent work of the squadron while with the advance guard. Took part in operations in the vicinity of Johannesburg, including the severe action at Valkheuvel Poort on 3rd June, when the Australians were again thanked by General French for their gallant conduct. Present at the release of prisoners at Waterval on the 6th June. On the 9th July reinforced General Sutton at Oliphantsfontain, and was engaged with the enemy on 11th and 12th. Took part in various engagements in the eastern Transvaal, including Lang Kloof and Swartz Kop, also in the operations in the Carolina and Barberton districts. The squadron embarked at Cape Town on transports Harlech Castle on 11th November, and Orient on 13th December, and arrived in Sydney on 6th December, 1900 and 8th January, 1901, calling at Albany, Adelaide, and Melbourne en route. The Roll of Honour contains the names of all the men known to have served at one time with the New South Wales Lancers and gave their lives in service of Australia, whether as part of the New South Wales Lancers or another unit during the Boer War. The NSW Lancers at the Remount Camp, Stellenbosch. The following piece is an extract from The Town and Country Journal, 9 December 1899, p. 13. The Lancers at the Cape. MELBOURNE, Sunday. - Files of Cape papers to hand to-day give accounts of the reception by the Mayor of the N.S.W. Lancers at Cape Town. Mr. O'Reilly, Deputy-Mayor, also spoke, and Captain Cox replied on behalf of himself and his men. He said some few of them would not for certain circumstances be able to go to the front, but the troops as a whole were ready for the work, and they might be trusted to go wherever, they were led. (Cheers.) As bushmen and men used to horses he had no fear of them, and he felt certain they would follow any body anywhere they were asked to follow. (Cheers.) In the afternoon the men were brought ashore and entrained for Wynberg. The quay aides were thick with spectators, and all along the dock road there were thousands of people who cheered and cheered again as the Australians went by with a jaunty swinging stride, their lances at the "carry," and looking as fit as a steel wire. All the war, to the station, and especially down at the to pier end of Adderley Street, the crowd was gigantic and the enthusiasm overwhelming.